Very few plants are as closely associated with a holiday as poinsettias are with Christmas. The poinsettia, native to South America, was given the botanical name Euphorbia pulcherrima, which literally means “very beautiful.” Its popular name honors Joel Roberts Poinsett, the first U.S. ambassador to Mexico, who introduced the plant here. Poinsettias make great holiday decorations and they’re often given as gifts in late November and throughout December. The showy portions of the poinsettia, which most people think of as the flower, are actually colorful leaves called bracts. If you are in North Central Florida, you have a unique opportunity to see (and buy) poinsettias in other colors besides red and white. On December 6th and 7th (Thursday and Friday), the University of Florida’s Environmental Horticulture Club is holding their 22nd Annual Poinsettia sale. Over 40 varieties will be offered for sale including traditional reds and novelties such as Peppermint Ruffles and Orange Spice. If you’ve purchased a poinsettia, or perhaps received one as a gift, you may have some questions on how to properly care for it. Your local UF/IFAS Extension office has agents and volunteer Master Gardeners that can answer questions on how to care for your plant beyond the holidays. They may even be holding classes or workshops, like UF/IFAS Extension Pasco County. Their class, Caring for Holiday Plants, will be held January 2nd (get details here). Don’t know where you county Extension office is? Find it on this UF/IFAS map. 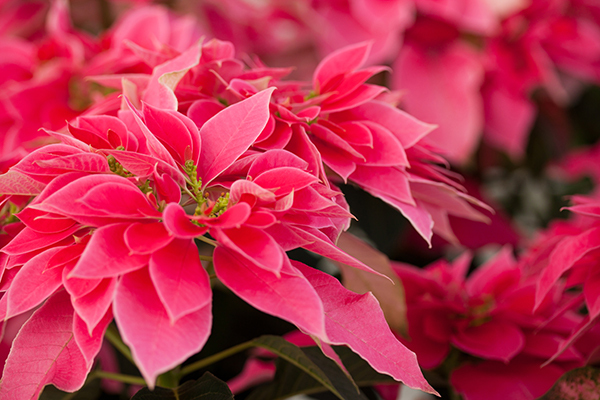 You can read more about poinsettias on the UF/IFAS Gardening Solutions website, too. From all of us at the UF/IFAS Florida Master Gardener program, a happy Independence Day to all the gardeners in the USA. Let’s celebrate with a firecracker…plant! Firecracker plant attracts hummingbirds and butterflies with a profusion of red, tubular flowers. Its narrow, soft leaves give it a fine texture in the landscape, making it a great contrast to broad-leaf plants. Read more about firecracker plant at UF/IFAS Gardening Solutions. In the time it takes to order a cup of coffee, you can help scientists document life on Earth! The Florida Museum of Natural History (FLMNH) is calling all citizen scientists to pitch in by completing one “Note from Nature” on Earth Day. What is a Note from Nature? Many items in museums have handwritten or hand-typed labels about a plant or animal in a collection. These labels contain valuable biological information, but they can’t be used to solve big research questions unless they’re digitized. By typing the information you see, you’re helping create a global database that scientists can use to track life on Earth, detect species in danger, gain insights into climate change and more. Post on social media with the hashtags #TakeANote for #EarthDay. Most Florida gardeners are busy today, preparing for Hurricane Irma, including those of us at the University of Florida. In light of this, the September issue of the Neighborhood Gardener is being postponed. We expect to send it out next Friday. All Hurricane Irma updates from UF/IFAS Extension are posted on their website. You should check with your local authorities more for immediate updates. Check with the Florida Division of Emergency Management at FloridaDisaster.org for important hurricane updates. Read Wendy’s message to gardeners for hurricane prep tips. Most importantly, gardeners, be safe and take care of yourself and your loved ones. Boniato – As the temperatures rise, many gardeners seek out ways to avoid working in their gardens, but for others, there’s no end to the gardening season. And this type of gardener laments the lack of edibles that can be grown in Florida’s warmest months. If you happen to be one such gardener, consider growing boniato. A member of the morning glory family, boniato is a tuber with the appearance and taste somewhere between a sweet potato and a baking potato. Hangin’ Out in a Basket – Hanging baskets are a great way to elevate the colors in your garden to new heights—eye level, to be specific. They’re ideal for people living in condos, apartments, or any place with limited to no gardening space. Pam Brown, a retired urban horticulture agent with UF/IFAS Extension Pinellas County shares her “secrets to success” on gardening with hanging baskets. Wendy’s Wanderings — I was only going to work in the yard for a few minutes; that’s why I was wearing flip flops. Three hours later, an unproductive fig tree had been pruned to the ground and my brand-new folding saw had been properly broken in. I stepped away from the project satisfied that the fig was going to come back in a few months and maybe have a new outlook on life. What I didn’t know was that within 24 hours, I would experience the fig’s wrath. Plant of the Month: Stokes’ Aster – Stokes’ aster is a lovely flowering native that requires almost no maintenance. For your lack of work tending this plant you’ll find yourself rewarded with showy flowers and evergreen foliage. Who doesn’t love a plant that looks fabulous with little effort? Attractive to both bees and butterflies, Stokes’ aster flowers are normally blue-lilac, but cultivars in other colors are available. This perennial does best in Zones 8 through 9A. Bumblebee in Peril – We’re all concerned about the declining honey bee populations, but let’s not forget about the bumblebees. January saw a first for a species of bumblebee in the United States, and not a good first. The U.S. Fish and Wildlife Service declared that the once-common rusty patched bumblebee (Bombus affinis) is now endangered. They cite a number of factors leading to the staggering 87 percent decline in population, including loss of habitat, diseases and parasites, pesticides, and climate change. Read more at the U.S. Fish & Wildlife Service website. Last Month for the Flower and Garden Festival – Even the heat can’t stop the Epcot International Flower and Garden Festival! The festival features fun Disney-themed topiaries, gorgeous gardens, and special events in the Festival Center on Fridays, Saturdays, and Sundays, including instructional seminars from University of Florida experts. May’s seminars include Beautiful and Easy Houseplants, Bee Abodes and Florida-Friendly Landscapes, and Orchids. Visit the Epcot International Flower and Garden Festival website. May in Your Garden – While summer may not officially come until the middle of June, in Florida May is the month to prepare for the heat (and hopefully the rain). Plant heat-loving herbs—there are quite a few to choose from! Mexican tarragon, basil, ginger, cumin, summer savory, and rosemary make aromatic and flavorful additions to your garden. Rabbits – Most people love seeing bunnies in the landscape, but they may not realize that rabbits could be responsible for damaged or missing plants in the garden. While you may welcome their cute little tails and twitchy ears, their voracious feeding can really take a toll on your plants. Rabbits feed on the tender shoots of young plants, and can even eat whole seedlings, leaving you wondering, “Didn’t I plant a whole row of veggies?” The best management is deterrence, and we’ve got a few suggestions on making your garden less attractive to these adorable little pests.